I'd like to take a moment to say thank you for all your support. Posted on October 31, 2014 by Peter Fenech. I was subsequently asked to cite proof that negative ads don't work, that residents want positive messages and to have someone to vote for. I could only cite the fact that many supportive residents in Ward 3 would vote me for because I brought a message, not an attack. It was seen as an empty (if noble) sentiment. I would not classify the statement as empty; I would classify it as optimistically hopeful. Are there not examples of positive campaigns that were successful? Can we not consider Jack Layton's rise to Official Opposition, or Barack Obama bringing a campaign of "Yes We Can" leading to the Presidency? Isn't Justin Trudeau's attempt to stay above the constant negative attack ads with a message of hope also relevant? Are these merely some examples of the exceptions to the rule? Searching for a sense on media coverage in Toronto may only lead to the realization that the media devours negativity. It is not solely the fault of the media; we as the consumers are captivated with a sense of negativity - ie. a car accident where everyone slows down to watch. A very good read about negativity is "News, Politics, and Negativity" by Stuart Soroka & Stephen McAdams. It details examples of how negative news is likely to get more attention. Negative news produces a stronger psychophysiological response. To go further into the findings would only make me more saddened by the notion. I have tried to keep my campaign as positive as possible. Many campaigns stay away from the negative and are not rewarded with the same media attention. The races most likely to be given media coverage will have scandal, intrigue, suspense & surprises. Yet we aren't watching a movie in a theatre, we are reading papers or watching the television about the future of our city. Negativity in the right context is a very positive tool to spur debate. For wards that felt many of the important issues were either ignored by an incumbent or the 'front-runner', a negative message of what is wrong is a powerful message. I would just ask a typical resident if they think their city council race is important and have seen it on television. If the answer is yes, it likely is one of several wards with intense ideological differences. I do not need to single out any of those races; they have enough media coverage as it is. Let's talk about Ward 3. Ward 3 has ten candidates running for city council. I have had the pleasure to meet 7 of the 9 other candidates running. The conversations have been cordial, the debates and interactions have been about policies, not personal attacks. Would a negative shift in any campaign alter who would be perceived as the front-runner? Do we even know who the front-runner is? My thoughts and opinions on the race will come in due time AFTER the election. I look forward to the analytics of the race to see breakdown strategies and other data indicators. What has a non-adverse council campaign accomplished - little to no media attention. Without verbal verbosity spewed with disgust and disdain, lacking of mob mentality and possible violence - Ward 3's race is low-key. I would have hoped the fact Etobicoke has 4 of 6 (including Ward 2) seats without an incumbent running, it would be a big deal. Having an almost complete overhaul of the representative face of Etobicoke may lead to a paradigm shift of our place in Toronto and our goals as a city. For all the negativity, what is the real-life consequences? Will the next council be divided again based on who's "team" they were on? Will ideology and political affiliations be on display? I have stated that I would not be endorsing a mayoral candidate. I know I will be able to work with any winner to make Toronto a better city. As long as there is a leadership that encourages open and honest debate; facts and good policy driving decisions, then there is hope. In closing, I will stay the course and promote my campaign with Policy over Politics. I will be open about the need to invest in our city. I will avoid the bullet point politics that seems to leave little information on "how, why, where, when, who"! I hope that residents also agree that a positive message is what this city needs. Posted on October 9, 2014 by Peter Fenech. Do you know how to vote in the upcoming Municipal Election? Toronto Elections Services has put together a series of videos on the process. Take a moment to stay informed. Posted on October 7, 2014 by Peter Fenech. Council candidates across Toronto are stating support in the elimination of the Municipal Land Transfer Tax (MLLT). It is a great campaign promise that was one of the policy platforms in the mayoral race in 2010, it has since not been reduced or eliminated. Why has it not been reduced, it is a necessary revenue tool Toronto needs to balance the operating budget. The MLLT was not a "back-of-the-napkin" implementation. It was implemented in 2008 and stemmed from the City of Toronto 2005 Long-Term Fiscal Plan. On page 106, the report realized it lacked adequate revenue sources to fund it's municipal responsibilities. When we reflect back to previous budget years, Toronto needed a "one-time" infusion of cash from the Provincial Government. Long-term fiscal planning cannot be sustained by waiting cap-in-hand for help. Since it as been implemented, Toronto has been able to better balance its operating budget, which is must do by law. The scare of having a crashing real estate market in Toronto has been a fear-mongering statement that has not been accurate. Toronto has one of the hottest real estate markets in Canada. If anything, the MLLT has allowed a bit of housing market stability by not having extreme sky-rocketing prices as seen in other parts of Canada. Housing prices are not affordable to many young families, the sad truth is that it could be worse. One aspect that many residents may not realize is that if you aren't buying a home, you are not affected by this tax. This is good for the residents who have lived for decades in their homes who continually see their property tax increased by those who buy, fix and sell homes. The increasing property values of the neighbourhood has more monetary consequence to the stable home owner. A great article by Matt Elliot from February 2013 titled "No good arguments for eliminating Toronto land transfer tax" is both insightful but also gives key facts and figures (including great graphs and charts) about the effect of the MLLT. On September 25th, seven Ward 3 candidates had the opportunity to debate on Rogers Cable TV (airing September 27th at 4PM). The MLLT was a topic of discussion where I had to defend my reasoning for not eliminating the tax. One point I brought up was the math, the MLLT brought in $356M into the Toronto Operating Budget. That represents 3.7% (as shown on the left side diagram). I stated that if we were to eliminate this tax and to make it "fair" by spreading it to all home owners, we'd have to almost increase property taxes by 10%. Property Tax: $3.762 Billion MLLT: $356 Million account for 42% of the 2014 Operating Budget. The average resident is not going to worry about the exact details of where their taxes are going or how it is collected, they are going to worry about the total they have to pay. As unfair as the tax is, many residents of Ward 3 would feel a greater impact if the MLLT was eliminated and brought in equally to all residents. During the debate, I also mentioned how an increase in the property tax will likely force senior residents to sell their home. They are already on a tight fixed-income budget that is struggling. There needs to be a real conversation about find ways to lessen the burden on our seniors who can least afford clawing of their income. As stated above, home owners who aren't buying and selling in Toronto are not paying this tax. I fully support the MLLT as a revenue tool for Toronto, albeit there needs to be further study on altering the funding formula to take into consideration inflation. It is not perfect and does put an undue expense on home buyers. Toronto has a REVENUE problem, not a SPENDING problem. My opponents continued to direct the need to create revenue from the developers of new developments in Toronto. I agree that many developers are not contributing enough to the city in regards to increased spending on infrastructure upgrades and community building. A better system for building a "community" was previously discussed in the OPEN HOUSE I attended in March on the Development Permit System. Even with a more functional permit system, creating the right communities, the MLLT is still necessary. One last point that I did make during the debate is the need for addition ways to find revenue. The report listed above about revenue vs spending did have an interesting chart about possible revenue streams. Would any of these taxes work in Toronto, would it replace the burden from home buyers to other specific demographic? I support the MLLT in its current state and will not vote to eliminate. Provide a realistic plan to supplement the revenue that is sustainable, I am willing to change my view. Election promises are filled with good intentions, they also need to be founded on solid factual data. Don't be fooled by a promise that many listened to in 2010, stay informed and vote accordingly. Posted on September 26, 2014 by Peter Fenech. We need to protect the ability of our seniors to remain in their homes or have access to affordable housing. Take a moment to read some information on the problems facing seniors today. Posted on September 23, 2014 by Peter Fenech. September 12th was a hard day for many candidates mentally, physically and emotionally. It is the last day to drop out or jump into any of the races for the municipal election. All the months of canvassing, events, strategy, platform creation stops for a few hours. The unpleasant truth is many politically experienced candidates often jump into races at the last minute. Strategically it may be a brilliant political move; saving all the effort, funding and support until the election "matters". To politicos and residents aware of the races, it is seen as opportunistic. I have been registered since February 7th, 2014. My campaign has been simple and true to my mantra of POLICY over POLITICS. I've been respectful to my opponents despite our differences. Each candidate will spread a message about where they see Etobicoke headed; various paradigms that may be generally opposing. I preface about Ward 3's race because it has been civil. This has not been the case for other wards across Toronto and I felt it was appropriate to address some other developments on September 12th. In late March / early April I had to chance to meet a gentleman who was preparing to enter a councillor race. We had talked about where we wanted to go in our campaigns and the issues in our communities. It was a great conversation that led into other meetings and now has spurred into a friendship. That candidate's name is Andray Domise and he is running for Councillor in Ward 2 - Etobicoke North. I supported Andray in April and I will continue to support his campaign until the end. Ward 2 is Ford Nation territory. Ward 2 has been neglected for several terms - I would suggest reading up on Andray's blog to get a sense of his view on Rob and Doug Ford's "legacy". 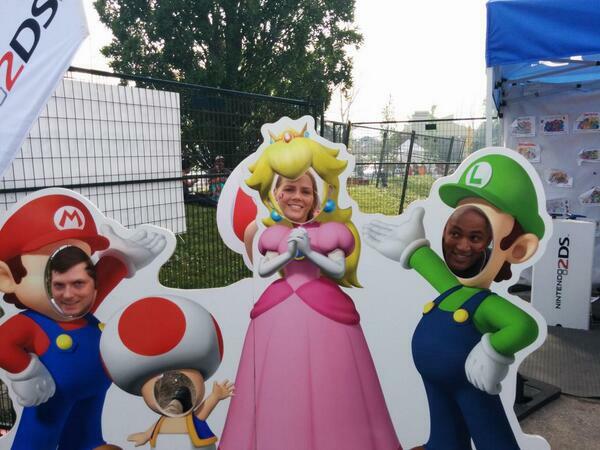 On July 1st I went to Ribfest at Centennial Park (in Ward 3) and later returned with Andray and Chantal to enjoy the festivities including some delicious food and of course the fireworks. What ended up happening was a chance to speak with John Tory who attended Ribfest. It was good to see a mayoral candidate in Etobicoke enjoying the beautiful weather. After having a good laugh with our Nintendo moment, we saw a moving crowd. It was Rob and Doug Ford surrounded by a mob. The next few moments will be best described in Andray's article for the Huffington Post. I bore witness to the events although I was not able to hear any of the conversations Andray had with either Rob or Doug Ford. I did however have my camera to take photos of the fireworks and quickly pulled out my camera for the impromptu meetings with the Fords. Confirming Michael Ford running in Ward 2. The fireworks were amazing this year. Andray was very upset after the encounters and it took some time to cheer up. He focused on the knowledge that he wanted to represent his ward and improve his community; to start to heal the wounds both Doug and Rob had inflicted on Etobicoke North. The night settled down and we did eventually get to enjoy one of the best fireworks displays at Centennial Park I've ever seen. Fast forward back to September 12th. Andray has been polling behind another Ford (Michael Ford) but was quickly increasing his chance to be the Councillor for Ward 2. The Ford machine did what they do best, do what is good for the FORD'S. The campaign deadline ended with Michael stepping down, Rob stepping down and a huge switcharoo. Doug is now running for mayor, Rob for Councillor in ward 2, and Michael for trustee. The nepotism of the situation infuriates me and many others in Toronto. We need to stop this circus! I will not be supporting Doug Ford for mayor. I will not be supporting Rob Ford for city councillor. We need to have residents across all wards get informed about who is running in their ward. Check the City of Toronto website to see who is your candidates. Read up on their platform, what are their policies and what is their vision for Toronto. I've had the pleasure to meet many great candidates from all across this city. There is hope in Toronto. There is vision in this city that will make it the best city in the world. If you live in Ward 2 - vote for Andray. He will represent with honour and integrity. If you live in Ward 3 - vote for policy - vote for me. No matter what ward is yours, vote for a candidate that represents what you believe a Councillor should be. Toronto needs candidates that will bring Policy over Politics. Candidates need your support: volunteer, donate and make sure you cast your vote. Posted on September 15, 2014 by Peter Fenech. Let’s take a moment and really analyze what being a candidate means for this upcoming election. There are 303 candidates for the 44 council positions. There are TEN wards with double digit candidates vying for a chance to represent their community. That’s approximately a 14.5% chance of successfully winning one of the council seats. Posted on September 4, 2014 by Peter Fenech. I know the only promise worth anything is one that is kept. Posted on August 31, 2014 by Peter Fenech. My official endorsement for NO JETS TO was published August 25, 2014. Informing residents about where I stand on this issue. Posted on August 28, 2014 by Peter Fenech. I am taking the time to say thank you and to promote Jerkfest 2014. It was a good experience to share with part of my canvass team in Ward 3. From great food to entertaining music and dancing, I was proud to attend and promote the event. I felt it necessary to write this post as our current Councillor took the time to promote another good festival in town "Taste of the Danforth" which was on the other side of the city. 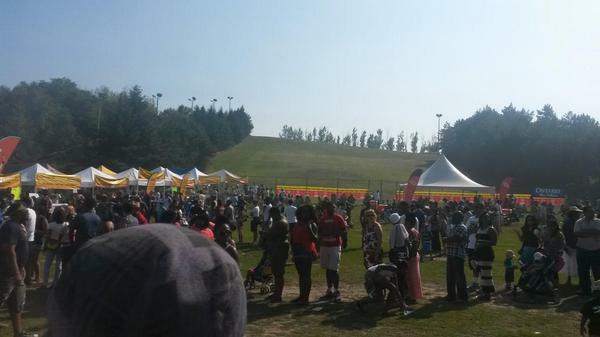 Jerkfest was at Centennial Park, right in our ward and was not promoted or mentioned on any social media or website from our Ward 3 Councillor. Unfortunate that Etobicoke residents may not have been aware of a festival right in our own ward. I hope to remedy this next year as Councillor. 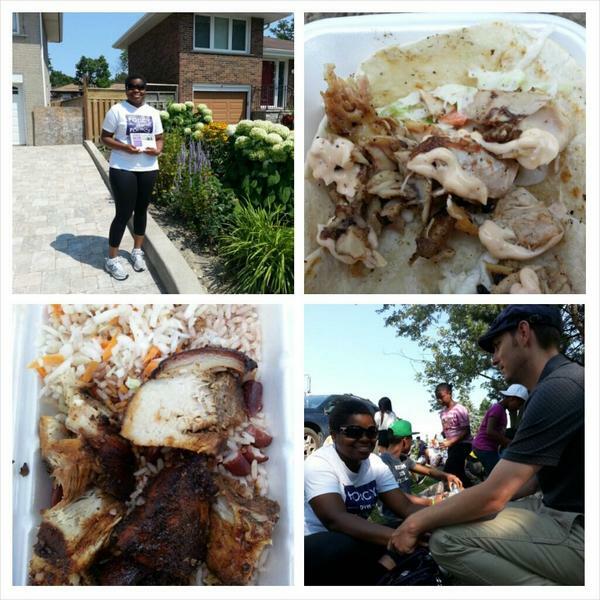 On August 9th I took part of my canvass team to enjoy some great food. We had been out in the ward spreading my message of Policy over Politics. A time to celebrate a festival within the ward was a great way to say thank you. The first part of the festival was dedicated to vendors and organizations. From music to arts, clothing to flags, there were many options to choose in supporting vendors. I took a keen interest in one booth because it captured the message of "building our community". I spoke with Clarence about the organization RISE ABOVE. Rise Above is an organization to help youth 16-26 become successful through social development, economic advancement and spiritual growth. We talked about the many different programs (which can be found on their website) offered and how the organization wished to branch out across the city. Currently Etobicoke is not serviced by their organization; they would like to establish a good relationship with the community and expand when given the opportunity. While I spoke with Clarence, my team was interested in supporting their organization by picking up a raffle ticket. I hope to be able to sit down with Rise Above as Councillor and see what can be done for them and many organizations looking to promote youth and opportunities for success. Please take a moment and check out their website linked above. We were all looking forward to checking out the large array of food options. My wife has been craving jerked pork for quite some time and was happy to be able to satisfy it here. The choice was finally made and we all decided on either Jerk Chicken Tacos & Jerk Pork with Rice & Peas. I needed a bit of water to calm my mouth down as my wife got a bit of extra jerk sauce on top to kick up the flavour. As we sat we got to listen to steel drum bands, watch children dance and enjoy the weather. I have always supported helping others, especially those you may not know. It is the reason I donate platelets as often as I do, saving a life is just the right thing to do. 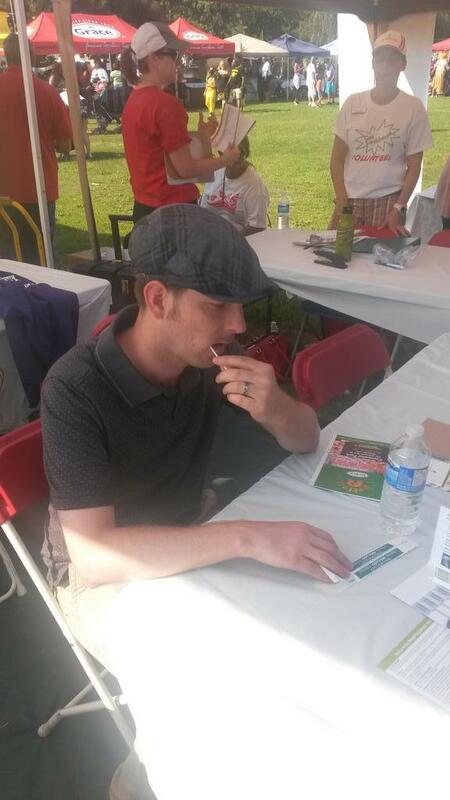 While checking out other vendors we came across ONE MATCH which was looking for a simple cheek swab test to see if males 17-35 could save a life. I have never signed up for one match, the lady I spoke to started discussing and I mentioned my platelet donation and next thing I was signing up. She said it was the easiest attempt. Please if you are a male, 17-35 click the link above and see if you are eligible to donate. You could save a life and it won't inconvenience yours! We enjoyed the festival and look forward to next year. Posted on August 10, 2014 by Peter Fenech. Do you feel safe in our community? I have not heard safety or crime as an election issue from my canvassing in our ward. This doesn't mean Ward 3 should not be vigilant in ensuring decreased crimes in our community. Etobicoke Centre residents may not be aware of some of the crimes or dangers. Below are a list of statistics, links and advice on how to prevent being a victim of crime. There are many resources that show that the top tracked crimes are decreasing. Specific crime statistics from Toronto Police Services (TPS) are narrowed down to Divisions; our division encompasses Etobicoke Centre & Etobicoke Lakeshore. Please note that not all crimes on chart below are entirely Ward 3's, crimes also from Etobicoke Lakeshore. 22 Division Crime Statistics - click on chart to see full details. How do you find out about crime in our community? There are links below that show neighbourhood crime statistics. They document location/date/crime and also overall statistics. The CBC crime map will narrow down a neighbourhood and crime, interactive and interesting to see the change in crime rates from 2004 - 2011. Take a moment and see what crimes may have been committed in our community. NOTE: Etobicoke Centre consists of the following neighbourhoods: Markland Woods, Etobicoke West Mall, Eringate-Centennial-West Deane, portion of Princess-Rosethorn. Etobicoke Centre is a safe community but continued vigilance by all residents can ensure that crime remains low. Click HERE to access crime prevention pamphlets from TPS on a variety of topics to keep you safe. Pamphlets I would suggest reading are: Apartment Safety, Auto Theft, Home Security & Protect your Children. Pamphlets are great ways to show children what to be aware of and what to do in a situation. A crime that children understand on a personal level is the theft of a bicycle. In context, it can be devastating to have something they cherish taken away from them. TPS recovers hundreds of bicycles a year, with approximately 20% returned to the owner. Have your bicycle registered with TPS HERE. Being registered will allow TPS to contact the owner if a bicycle is recovered. Bicycles that are not registered may eventually be auctioned off. It only takes a moment but is important to have a chance of recovery. Only together can we prevent crime in our community. I hope that the links and information provided will help in being aware how you can stay safe. Posted on July 24, 2014 by Peter Fenech. UPDATE: Metrolinx Kipling Mobility Hub website now includes DISPLAY BOARDS AVAILABLE online. On July 15th I had the pleasure to be the only Ward 3 Councillor candidate to attend an important information session about the proposed Kipling Bus Terminal. The basis of the forum was to explain two new proposals for a complete overhaul to Kipling Station. The forum had representatives from Metrolinx, City of Toronto, Mississauga Transit and consultants. The room was fairly packed and included Russ Ford (council candidate in Ward 6), council appointees Peter Leon & James Maloney. Mextrolinx has identified Kipling as an "ANCHOR HUB" for transportation. By implementing a Kipling bus terminal, Mississauga & GO buses would have access to both subway and GO Train service. Mississauga buses would have a station that is accessible (as Islington is not). This project coincides with a revitalization of Six Points Junction or "Spaghetti Junction" with road alterations and development plans. This information session was necessary to inform the public of the Toronto Hydro's change in policy to allow any new facility within their hydro corridor. The original Kipling bus terminal would have been located closer to the current passenger drop-off location. That proposed design was a great design, which I wish could have been the template. The need to change the design has been one of the main reasons for delay. The two proposed bus terminals are very similar in design. Both would have the new bus terminal located in the same area (currently parking area near 101 Subway Crescent) and would use Subway Crescent solely as the access point for Mississauga Transit and Go buses. This location was the only viable option based on the restrictions from Toronto Hydro. The bus terminal would be connected to the current west entrance of Kipling Station by an open pedestrian walkway and an underground tunnel. Each proposal would remove parking spots from Kipling Station. This cannot be avoided and was a concern brought up by several residents who felt there needed to be MORE parking. Proposal #1 would have the bus terminal connected to Subway Crescent, TTC buses would not be effected from their current routing. This option would have a single access point to parking from a new entrance at Acorn Avenue. This new entrance would also have passenger pickup parking different than the current layout; no more circular parking, a traditional parking lot that is more functional. Proposal One would keep traffic off of Auckland Road, giving quicker routing for TTC buses. This would also rid the corner of Subway Crescent and Auckland Road that has always been a dangerous intersection. Proposal #2 has same bus terminal, access point to parking from Acorn Avenue but would have it connect to Auckland Road. This would give two points of access to parking, a side-of-the-road type passenger drop-off with a lesser amount of spots. Parking in this design would have approximately 50 less spaces than option #1. Traffic would have options but would narrow the pedestrian walkway, have a similar busy intersection like Subway Cres. & Auckland Rd. Several questions I had were answered by the panel about future transit expansion. 1. The City of Toronto seems determined to extend the subway to Sherway Gardens. That concept is one of the main reasons for the lack of development along Dundas Street towards the 427. I would fully support a subway extension (and as discussed, could mean the bus terminal may also move locations). The one obstacle to expansion above ground is the 101 Subway Crescent building. If the city had the ability, it would have had an above ground link over to Honeydale Mall area, this is not possible. The subway extension would have to go underground and the cost skyrockets; which is why the delay and little discussion on such a project. 2. Dundas Street within the "BIG MOVE" has a BRT (Bus Rapid Transit) which would also connect to Kipling Station. It would be a bus route from Burlington to Kipling Station, opening up 40KM of connected transit. The forum allowed questions from residents that wanted to know about safety, amount of buses added to Kipling Station, parking, development and finally functionality. Residents of 101 Subway Crescent felt as if the current proposal would leave them dealing with over 760 buses along their building access. With the bus terminal outside their building, 101 Subway Crescent will be directly effected by the changes. The forum was a first step in utilizing Kipling Station properly. The next steps include sending proposal to City of Toronto in 2014, building up to a completion date of 2019. It may seem like a long timeline, but five years for transit improvements are worth it. Posted on July 16, 2014 by Peter Fenech. There are over 240 candidates for councillor across the city, a staggering number for only 44 seats. Some wards have double digit candidates that will being out canvassing to show why they are the best choice for council. My recent canvassing of Ward 3 residents has been a positive experience. I've been congratulated for my effort as a resident of the ward to represent our community. I've also been told that all politicians (including candidates) are all corrupt and cannot be trusted; to which I vehemently disagree. The two extreme opinions are examples of why voters may feel disengaged. Residents simply want a representative that leads with integrity. With voter turnout in our ward at 53.84% for the 2010 election, many residents simply just don't feel a part in the process. This election is very important for the future of Toronto and our community within Etobicoke. Decisions on spending or saving, transit expansion and infrastructure maintenance will need to be made. Residents worry about access to facilities, the conditions of our roads and the long transit trips to their jobs or schools. All are important issues that will be addressed in the lead-up to the election in October. All candidates across the city will speak of integrity, the need for change and how they are the right choice. Change is hard when incumbents have a 90% rate of being voted back into their position since 2003. Incumbents speak of experience as their reasoning for being re-elected. Haven't we experienced a council in distress for the past four years?! I believe all candidates in our ward will serve with integrity, it doesn't need to be said, it should be expected. Residents are bombarded with political literature, each an introduction to the candidates. Literature from mayoral candidates, council candidates and also trustee candidates. The whole process is mind-boggling and only exacerbates voter fatigue. Fatigue also comes from partisan politics within Toronto City Council. There are no official political parties within municipal politics, it is one of the reasons why the election is so long. It allows residents who hope to represent their community a chance to engage the ward. It is hard to swallow when a candidate speaks of partisan politics and political decisions at city hall and then promotes the endorsement from members of a political party. It is disingenuous and has been a point brought to my attention by a resident who handed me an opponent's literature. I am not endorsed by a political party; my support and donations have come from supporters of all parties (Liberals, Conservatives and NDP). This is a point of pride for me; my ability to bring policies that are right for the community that the majority can support. There are currently 7 candidates running in Ward 3 and I can say I have not heard much policy from many of my opponents. Catch phrases and vague outlines for what they support are some of the only content on their websites. I have set out with policy as the vision of my campaign. Policy matters, policy is the change we need. Not all of my policies are listed online as my opponents are now promoting similar policies I listed back in March. Directing the conversation is important; listening to resident's ideas is more important. Many residents at the door have been receptive to my policies I will attempt to implement once elected that are not listed online. It has led to different ways to view our community, our transit system and of course the duties of council. Bullet point politics has been around for as long as I can remember. Residents want information to base their decisions on, they have asked my views on many policies I have stated on my website. They have also brought up problems that I was not aware but wrote down to discuss with my policy team. The problems and the solutions will not come solely from a Councillor, that would exclude community input which is vital. Some residents don't agree with my policies but will 'keep an eye on me' for being open and honest for what I believe before deciding who they vote for councillor. Take a moment and examine all the candidates in your ward. What are their policies and who do they represent? I hope that once you compare the differences, I can count on your support by volunteering or donating to a campaign that can make a difference in our ward. Posted on July 13, 2014 by Peter Fenech. Toronto World Pride 2014 was one of the biggest events Toronto has ever hosted. 10 days of celebrating inclusion of all people while bringing awareness of how far many parts of the world still need to go. Toronto has been a progressive voice for the LGBT community and a beckon of hope for many afraid of persecution or alienation. Those unaware of the struggles often view any Pride as a over-the-top celebration; I think of Pride as a demonstration of the fight for equality. The opening ceremony concert occurred on June 20th at Toronto City Hall. The crowd was huge and in great spirits for the concert that was to kick off World Pride. Kathleen Wynne took to the stage after her recent majority government win and spoke about being the first gay leader of Ontario. It was a heartfelt testament to the acceptance of equality but reserved with the thought that there were still countries persecuting LGBT (including death). The opening ceremonies led up to a show by Melissa Etheridge and fireworks over the crowd. A city united in celebration, a city ready to talk seriously about the issues that still effect the LGBT community. I was glad to be present for the opening and a witness to a piece of Toronto history. On Saturday June 28th I took the time to walk down Church St. and interact with the vendors and sponsors promoting Pride. I also saw that World Pride was both an international draw but also an event attended and supported by many family structures. Gay or straight, the crowd was welcoming and inviting and inclusive. I also got to meet Karen Stintz as she was walking amongst the crowd and happy to see mayoral candidates supporting World Pride. My last stop of the day was to speak with Kristyn Wong-Tam (city councillor for ward 27). We spoke about Pride, politics and why I was downtown and not hitting doors. I responded appropriately by saying "World Pride is an event that celebrates Toronto and I couldn't miss the chance to be a part of it." I wish her luck in her re-election and look forward to possibly working together in December. My last support of Toronto World Pride was to catch as much of the Parade as possible and to attend the closing ceremony concert. I have always been a huge fan of Tegan & Sara who were closing out the concert. The Parade was fun and interactive, supported by a large amount of companies and organizations. Politicians showed their support; the Liberals walked with Justin Trudeau, mayoral candidates Olivia Chow and John Tory each had their own floats; all a show of support for World Pride. Despite the hot weather and the chance of rain - both the parade and the concert were packed. Residents of Toronto and from around the world united in a celebration of a future that makes being LGBT a non-issue. What better way to end an event than having 2 amazing performers like Tegan & Sara promote Canadian music. The night begun with rain, followed by a rainbow and ended with cheers and fire. World Pride closing concert, celebrated by all. I was proud to represent Ward 3 & Etobicoke for World Pride. Together we can promote a world where everyone feels included and safe from harm or persecution. Posted on July 1, 2014 by Peter Fenech. It is appropriate to discuss infrastructure after last night's rain storm. From the onset, the amount of rain and the damage seemed disproportionate to what we should except. Should a steady rain over a few hours have the ability to cripple parts of the city? Are we complacent in funding solutions of our ageing infrastructure? Should we expect blackouts to accompany any rain in parts of the city? In 2013, Toronto (and especially Etobicoke) were hit with two separate weather related events. The flooding in the summer and the ice storm near Christmas were devastating to the day to day lives of many residents. Flooded basements, blackouts, cars stuck on the road overcome with water and a sense of chaos were the first signs of a need to spend on improving our infrastructure. Having a multi-day blackout and destruction of Toronto's important tree canopy in December left many families scrambling at Christmas to stay warm. Without power, there was also the chance of causing further damage to homes as water could freeze. How did we get to this point of being overcome by simple storms to such an extent? I believe most residents need a bit more information than a tweet from the City of Toronto. Overall residents I've spoken to just want to know how the city is going to respond to weather related events. Residents want to know how preventative measures will be put into place. The worst aspect about weather emergencies is who to contact or the timeline for issues like blackouts or closures of transit or highways clearing. Flooding on the far side of the city can still have a significant impact to a community not directly effected. Residents need to take a moment to ask themselves if they are prepared for a weather related event. Do you have food and water in case of an emergency in both your home and your vehicle? Do you know who to call, where to look for information about a particular event? Have you weatherproofed your home and made sure you clean all drainage pipes or cleared snow from around your home to prevent flooding? No one wants a repeat of the 2013 flood and ice storm. Many residents are expecting the city and also council to make decisions that will help preparation and prevention. The Toronto City Manager is preparing a report for the July 2 meeting of Executive Council. The report will review the outcomes and will be fully posted when complete. A link to the "IS TORONTO WEATHER PREPARED?" is available for further information. The city also has a page with more information on PREPARING FOR EMERGENCY WEATHER AND EVENTS that goes into detail about how to be informed about events and how to prepare. I suggest you take a moment to read some of the information, especially the EMERGENCY PREPAREDNESS ACTION PLAN. One of the platforms of my campaign is Infrastructure. I have put Emergency Preparedness as a policy that needs to be discussed and acted upon. Having lived through two major weather related events last year and the increasingly number of regular blackouts, it is important to make sure that council are protecting residents. What else can be done? Please leave a comment or email to info@peterfenech.ca any thoughts or suggestions to improve Toronto's preparedness to weather related events. Posted on June 26, 2014 by Peter Fenech. What are the real duties of a Councillor? A question I have been asked repeatedly is "What does a Councillor actually do?" This is a good question to ask since the general public sees only a fraction of the busy work being done at City Hall. The majority of people who asked me the question had known some Councillors to attend the fun events hosted in the city and also council meetings. The past few days have opened my eyes to another aspect of what is involved in being a Councillor. I have attended two events in the past week that were not attended by sitting city Councillors. The events were not photo ops, they were not 'feel good news stories' and yet they were extremely important. The first event was a benefit for Griffin Centre in North Etobicoke. The centre had recently made headlines when comments from their city Councillor stated the centre "ruined community". I would beg to differ. The Griffin Centre mission "delivering services to people who thought their needs didn’t count." I was glad to attend the benefit and proud other council candidates Jolene Hunt & Andray Domise showed their support as well. The second event I attended this week was a fundraiser and 16th anniversary for The Gatehouse in Southern Etobicoke. The "Letting in the Light" fundraiser helps the refuge achieve its mission statement: To provide support, resources and advocacy on behalf of those impacted by childhood sexual abuse. A great group of people attended the event. We were lucky to hear some personal stories and accounts of how The Gatehouse had changed their lives. Andray Domise joined me in supporting another great organization within Etobicoke. These are accounts of just two events. There are many that should be attended by Councillors from across the city. Organizations like Griffin Centre & The Gatehouse, The Red Door Shelter and Street Haven hear the voices of those residents; the residents in need of real help. These organizations provide support for our neightbours who find themselves in abusive relationships. They provide counselling to victims of childhood sexual abuse. They help victims release the pain of shame and blame. How can we expect to build and strengthen a community if we tend to ignore those who are struggling to survive? How can we expect those in need to even believe help is available if we don't shine a light on organizations that are there for support and guidance? In my opinion, councillors need to make serving the residents of their ward their top priority. If my mention of these organizations makes just one person donate their time or money, which in turn helps just one person escape from a bad situation, I've done my duty. Yes, there are organizations that are positive, bright and happy. They are also very important to our community. I look forward to promoting their message and how they benefit the residents of Ward 3 as well. There are many organizations that are important to our residents and need to be viewed as such. We just need to understand that while some residents stand laughing while enjoying a fun and exciting event, there are some residents who stand in the darkness, feeling alone. Please take a moment and consider what is important to you and what you believe your Councillor should be doing. I feel councillors are the voice for our community and should make sure that every voice is heard. It is my hope that if I become Councillor for Ward 3, that I can promote many great organizations across this ward. We can build a stronger Etobicoke community together. Posted on June 18, 2014 by Peter Fenech. I recently had a discussion with a resident from Ward 3 who felt that "all politicians and candidates don't keep their campaign promises." This resident felt that hearing all levels of government for the past decade break promise after promise was a valid enough reason to not believe anyone. I agree with that point of view regarding broken promises. I don't like breaking promises; it is why I have very few promises as a candidate for ward 3 Councillor. A look at my POLICY page will show a major difference between what I state versus that of a 'politician'. That important difference is that I SUPPORT good policy rather than promising what I can't guarantee. I will be committed to being effective; while not being stuck on specific solutions. My platform is based on supporting policies which make sense from data and input. Being willing to work hard with other Councillors, city staff and getting great input from residents and community groups. This will only make the policies better built and widely accepted. I will use the data available to convince all parties involved why a policy should or should not be adopted. This doesn't fit the norm of what many have seen from council during that last four years. It is without the drama and daily entertainment news coverage but will be effective. One aspect of making/breaking promises to residents of Toronto is the reality of a changing world. Natural disasters, a shift in the economy or a major advancement in technology are very powerful forces that may alter a promise. As most campaign promises are linked to financial restraints, they may not all be feasible in the city budget next year compared to the last. Is there a difference of a broken promise and a promise unable to be kept no matter how much effort is put in? Using the example of time-based transfers, I did not promise to implement this policy. I do support this policy and would vote for it on council. Unfortunately policy implementation goes beyond the capability of one Councillor. To bring forth proper legislation, it is necessary to have a majority on council with recommendations and implementations from appropriate committees. I fully support time-based transfers. I do hope that it can be introduced very soon once elected. I hope to be able to communicate my willingness to uphold my promises. I hope that many policies I support will also be implemented. Good policy is great for Ward 3 and paramount for a prospering Toronto. Expect more from your politicians, I know I certainly do! Posted on June 8, 2014 by Peter Fenech. I have created a survey that will allow for feedback online about issues within Ward 3. Not everyone is ready at the door to discuss what they believe is wrong/right with Etobicoke Centre. This will allow for input that is both necessary and valuable in directing the campaign for city councillor towards shared problems. Please take the time to respond to the survey, it is set for only 100 responses. I will post the top issues and concerns by residents of Ward 3 once all the data has been collected. Posted on May 12, 2014 by Peter Fenech. The issue that came to mind without thinking for some residents in Ward 3 was 'potholes'! I myself can understand the answer since driving along some of the major and feeder roads in the area and surrounding wards have been frustrating. At the bottom of the ward on Dundas Street W., it took quite a long time for the small section between the border of Mississauga, under the 427, and over towards East Mall to be fixed. Late night construction, endless hassles for commuters felt like it would never end. Since its completion it was a necessary fix and one that has been beneficial to the area. The issue is that Dundas Street W. needs to be fixed all the way to Kipling (in Ward 5) with potholes recently large enough to damage cars. Potholes have an effect on many types of residents for a variety of reasons. How can I get a pothole filled in? What can be done if your car is damaged by a pothole? Have you ever wondered what the process is for reporting damage to your vehicle because of potholes? The worst part of assessing the damage is to know the steps to report it to the city. The link above will direct you to the cities page on how to claim for damage from a pothole. The process itself is connected to regulations on what type of road and the size and depth of the pothole is and the amount of time given to fix (which is located under ONTARIO REGULATION 612/06). There are many technical issues in relation to the type of road based on volume and speed, but being informed may help any solving an issue or claim. Hopefully you will not need to report an accident or injury because of a pothole. What is the solution to better roads? Infrastructure is an important aspect of a community that needs constant care. The quality of materials and the need to constantly repair roads need real solutions. Taking the time and doing the right repair at the right time is important. Filling potholes are short term solutions but does not offer a long term one. Kingston Ontario is investing in "premium" asphalt that is of a better quality. There are supporters and detractors to such an idea of "premium" asphalt, but an idea that may help solve the problem of 170,000 + pothole repairs done annually. Please read an article on ASPHALT that discusses potholes HERE. Fix the problem of crumbling roads by trying to manage the backlog of repairs. The city has set aside hundreds of millions of dollars for repair over the next decade. This a positive but some roads cannot wait years to be fixed. Pushing forward with an aggressive and fast-track system to speed up the process and identify a way to do more roads quickly is needed. This would also be a great time to re-assess the nature of usage of the roads and think of community building with adding bike lanes. This will be a issue that should be brought up by all candidates. Feel free to add your comments and suggestions on how we can fix the pothole problem in Ward 3. Posted on April 19, 2014 by Peter Fenech. This is a simple post, best understood by the picture below. As seen above, There are no projects currently in our ward that connect us to Toronto. A great transit project that runs along the top of Ward 3 is the Mississauga BRT that will allow for a quicker trip from end to end of Mississauga when completed. The last stop will be Renforth Gateway (a connectivity hub). A great benefit would to have Phase 2 of the Eglinton Crosstown meet up at Renforth. This would allow for the possibility of connecting the West-end of Mississauga with Scarborough. Posted on April 15, 2014 by Peter Fenech.